In my garden, the appearance of herby green sorrel, in all of its fresh green, lemony-splendor, means spring is in full swing. To tell the truth, I inherited the plant, and never really had a passion for it, never had a go-to dish to use it. Until I learned from fellow chef/restaurateur Cindy Pawlcyn to make it into salsa. Roasted tomatillo salsa. This salsa makes a spectacular addition to virtually any taco. Here, we’re using chicken breast, but grilled vegetables, steak and shrimp would be great companions, too. Quick note: If you can’t find sorrel, “wild” arugula or watercress are delicious in tomatillo salsa too. Heat the broiler and adjust the shelf to its highest position. Spread the tomatillos, garlic and chiles on a baking sheet, slide under the hot broiler and roast until the tomatillos are soft and lightly blackened in spots (about 5 minutes per side—the garlic and chiles should be done in about the same amount of time). Cool to room temperature, scoop into a blender jar (including any juices from the tomatillos), add the sorrel and pulse until you have a puree that’s nearly smooth. Add a little water (usually about 2 tablespoons) to give the salsa an easily spoonable consistency. Taste and season with a little salt if it needs it (believe it or not, sometimes it doesn’t need any). Pat the chicken dry with a paper towel and season with a generous sprinkling of salt. In a very large (12-inch) skillet set over medium-high, heat enough oil to coat the bottom. Lay in the chicken in a single layer and strew the onion slices into the open spots. As the chicken sears, nestle in the onion slices, turning them as they brown. When the meat is richly browned on one side, turn it over and brown the other side, about five minutes more. 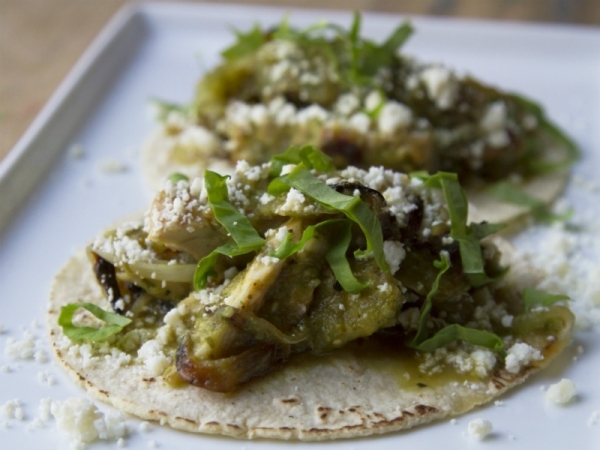 Pour the sorrel-tomatillo salsa into the pan, spoon the mixture into warm corn tortillas and top with queso fresco. Disappointed! I searched for a cheese and bean enchilada recipe and found nothing. My guests do not eat meat. I was hopeful Mr. Bayless would publish more recipes excluding meat. Thank you. 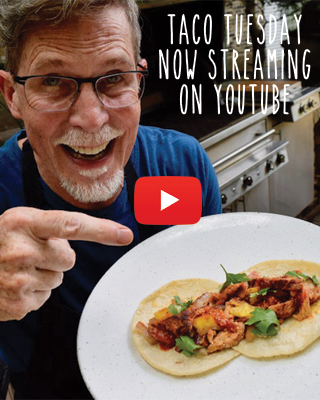 Hi, please consider taking a look at the “Taco Tuesday” video series, which has lots of vegetarian recipes. Here’s the link. When I saw this recipe I was hoping that it was for the sorrel (as its called in Jamaica) which is the Jamaica (hibiscus flowers) of Mexico. In Coyacan I had delicious empanadas of Jamaica blossoms. I’ve found one recipe, but it never explains how to get the flowers soft and chewable. My limited Spanish doesn’t help.